There's still no end in sight for MLP, with a movie just out and the show continuing into its 7th season. In many ways, the show's character arcs have reached their endgame, which is quite nice to see - it forces the characters to grow and develop further from there, and means the show can't just endlessly freeze itself in the same cycle of character ambitions and dreams. 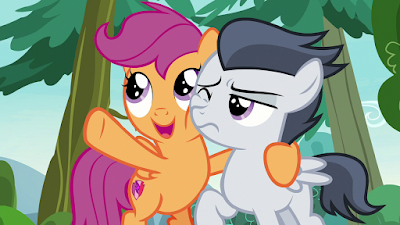 The Cutie Mark Crusaders have their Cutie Marks, and now set out to help others. Rainbow Dash is a wonderbolt, and has issues as part of the team rather than as a rookie. Twilight is used to being a princess now, even if still a neurotic one, and mostly imparts lessons to others. Trying to make Sunset Glimmer a major character isn't working that well. The show doesn't seem all that convinced of her, not even making a place for her in the intro (which still revolve around the friendship lessons that haven't had much of a place in the show for a long while). Some of her interactions with Trixie are fun, and she's at least a welcome voice of cynicism sometimes, but she's just not interesting or likeable enough to carry episodes, and there's already a large cast of characters who can lead episodes and learn the same things she does. On the other hand, surprisingly it's the show starting to plumb deeper depths of its lore that keeps this season interesting amongst several dud episodes about Rarity's fashion boutique or being more friendly with the dragons. Having more of an examination of Starswirl the Bearded made for a compelling cliffhanger into the finale, even if it's very awkward writing that allows Twilight not to see the obvious consequence of her spell from the beginning. I also loved the episode where Rumble became the focus. He was an extremely minor colt with just one speaking line before, but there was something very cute about him and how he was one of very few boy ponies to be given the same face shape as the fillies. I always liked him in fandom and with his brother Thunderlane getting featured more, it made sense for him to have an episode. He had a bad attitude and his voice evidently dropped, but he got a great song, I liked the underlying issues his attitude was copying and generally I'd enjoy seeing him featured again, questioning the things blindly accepted by pony society. The show also let darker elements of Scootaloo's backstory come through some more, while not being explicitly tackled. Absent parents, abandonment issues and disability make her a potentially extremely interesting character for such a light show. Because it's so light we can't count on much more than hints of an underlying sadness, but those notes are sweet when they're hit, just like finding out more about Applejack and Applebloom's parents. But I still have my doubts about stretching this show out too much more. With most character arcs completed, episodes with just the 'Mane 6' hold the attention less and less, and they can't keep relying on new characters or fleshing out previously minor background ponies without a feeling of scraping the barrel. I don't mind another season or two but they really need to take on a bigger scope and work towards something bigger than how well a shop runs or whether or not your friend genuinely likes the cakes you make her. If the show continues much longer, I'd like to see it try to get more serious.